How do you keep your SL & RL relationships separate and balanced? 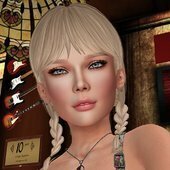 Would you quit playing SL if your RL partner was upset about the SL relationship? Does SL become addictive? Yes for me SL has been highly addictive, because it has been very satisfying for certain emotional and mental needs I have. How do you keep your SL & RL relationships separate and balanced? I don't keep them separate. The biggest reason I am in SL is because I can't get enough of my partner in RL. Would you quit playing SL if your RL partner was upset about the SL relationship? If my spouse gave me the ultimatum of them or Clover, I don't think he would like what I would pick. However, since he encourages our relationship I don't see that happening. Possibly. Any form of escapism can become physiologically addictive. I live in the most easiest circumstances: No relationship in either life. If I had one in real life, I wouldn't start one in SL and I wouldn't take an SL relationship into real life. Romanticallt my SL is my RL we just can't physically be together full time right now. Never expected it. Certainly didn't join SL looking for it. It just works as it is right now for both of us. RL friends and relatives on both sides are aware of if. I don't expect them to understand it because I don't always understand it. As far as friend relationships go, I have met some SL friends in RL, even been on holiday with one. There is no secrecy. Is it addictive? I guess for me it is. 1) I only have one close relationship at a time. Both RL and SL. 2) Would I quit SL for my RL-partner? No.Not at all. But I would quit that SL relationship for them. 3) Does SL become addictive? Some long dead philosopher once said : "The right dose can make everything a poison, or a medicine" - so yes I think SL *can* be addictive to some .As for me, I consider it a hobby - just like writing and drawing. Even my therapist says "Others sit in front of the TV for 10h a day, so the time you actively spend in SL is okay, as long as you don't neglect your RL contacts." That said, with a former account, I experienced in 2008/09 that one of my friends lost their job, and one an apprenticeship, because they had been inworld for too long and overslept the next day - or rushed from logging off after 20h in a row inworld, to their job where they then lacked concentration to do the work correctly. And in my opinion: As soon as SL becomes more important than RL, you're an SL-Addict. Since this experience, I've made a set of rules I that I live by, and that I expect my subs to live by - and Rule #1 is "As first and most important rule: Your Real Life *always* has first priority, no matter what's just happening in SL. If you have to attend your RL (either by going "AFK" or by logging out), you don't have to ask for permission to do so. Just let Me know, that's enough." My sl relationship IS my rl relationship, so no worries. Anything can be "addictive" if someone wants it to be. For some folks...most things are, to varying degrees. each person will have to decide for themselves how often their SL and RL intersect. some will keep RL and SL completely spate by not even talking about their RL with anyone. they simply choose to have friendships and not romances in SL. others may choose to have romances in SL but will warn their partner that it will never leave SL. many others don't care either way and will tell their RL info as well and don't mind RL interactions. in this case, it's irrelevant what any of us on the forums have as our relationships or ways of living. the only thing that mattes is what is important to YOU. you are the only one that needs to decide how to keep them balanced. you need to find out how much time YOU are going to spend in SL and what activities you will engage in. if you partner up with someone romantically then yes, you might have sl and rl intersect as the person you interact with could be cat fishing you or they could be crazy and track you down if you cheat on them or they could be super awesome, who knows. you roll the dice each time and hope for the best. it's up to YOU to decide if you would quit SL if your partner was upset. but first ask the question, WHY is your partner upset. what are you not providing them that is upsetting them. are you providing enough care, attention, time for them to feel loved and cared for in the relationship. if not, why are you still partners and is it fair to THEM. if you want to continue to be partners with them in RL, then you will stop doing things that upset them. if you don't care how they feel, then you can basically do anything. all up to YOU and your RL partner. addictions to SL can happen. but you can also get addicted to alcohol, drugs, gambling, soda, chocolate, etc. you can get addicted to anything if you want to. if you feel like you are getting addicted, then YOU need to ask for help from friends/family/random strangers/that person down the street with the van with no windows and shag carpeting. basically, the entire questions you are asking, it really doesn't matter what others think. it only matters what is important to YOU as you are the one that will be impacted in those situations. My real life husband knows i'm on second life and we both agree that its best to keep the relationship open because other then bedroom needs we're perfect for eachother, but theres things i like that he doesn't and vice versa, so we can't exactly please eachtoher there. we both have an sl account but we've never seen eachother inworld because we're not in the same sort of groups. any relationships we stumble into on sl pause when we log off. I;m fairly certain that's what the OP was asking...the answers that folks responding have *for themselves*, lol. *whisper* President of the peanut gallery, i want to start by saying i love your postings in the forums. you are usually the voice of reason and have great comments. and no, this is not one of those starts where people say something nice to you and then rip you apart lol. i do normally fanboy on your posts. just had to say it. as for this thread i try so hard not to post on threads like this where people ask that questions LOL. on this one i broke my own rule Tari. to me the question is equivalent to an OP living in the Philippines asking someone in Canadian how they dress for the winter so the OP can decide how they should dress where they are. the OP would need to look at their OWN body, the weather in their location and what their mode of travel is to figure out what they should wear. How do you keep your SL & RL relationships separate...? By not keeping them separate. I suppose not, since that would imply my believing it’s OK to have both. SL is to me, an escape from the humdrum of RL, a place where the dishwasher doesn't overflow on the kitchen floor, kids don't need to go to the doctor, and I can be happy with the way I look. But at the same time the very best things are missing to. I would never give up those things I have in RL for any of this. Trust is big thing for me. Love trust and bond. Once trust is broken it can never be again someone have to be upfront and honest. Every one has there freewill has a story. I just could never be with someone that is taken but ever floats you boat but if you get caught you have to deal with the consciousnesses. 1.How do you keep your SL & RL relationships separate and balanced? 2.Would you quit playing SL if your RL partner was upset about the SL relationship? 3.Does SL become addictive? 2. If I had an RL partner and they got mad about my SL relationship... I'd have some questions/things to say. Does my RL person play SL? No? Am I neglecting them in RL? No? Then hush! Which relationship has gone on longer? Is the RL person someone I actually plan to marry or are we just seeing each other? Does the RL person satisfy whatever needs my SL relationships are filling? Yes? Okay maybe now we can talk about me not having SL relationships...but I doubt such a person exists lol. 3. HELL YES IT DOES. Anything can be addictive really.... Humans are pretty predictable when you look at how we respond to things that make us happy or fulfill us in a certain way. For me personally its something I'm mindful of since I get so much fullfillment from it. In my mind it should never be a replacement for RL just something to augment it... and its all yours. to me the question is equivalent to an OP living in the Philippines asking someone in Canadian how they dress for the winter so the OP can decide how they should dress where they are. the OP would need to look at their OWN body, the weather in their location and what their mode of travel is to figure out what they should wear. I view a relationship inworld the same as one anywhere with a real person so mentally cheating is still cheating. I have a strict no relationship beyond plutonic for that reason. Chardy has got tear stains from all the people in busted up relationships crying on my shoulder years on end one after another trying to console them :(. Guard your heart in SL because you will find someone that shares the same cyber fantasy and the bond is so easy to do. I never forget its not real and RL must come first including sleep and family and friends etc. As for addiction just like smartphones, social media, poker machines, and other electronic devices gaming is addictive as it stimulates the production of dopamine in your body. Alcohol and recreational drugs do the same thing. So I guess SL might be doubly addictive as feelings of love and relationships exist as well and you need more and more of it for the same high. When you try to stop you may experience withdrawal symptoms and will need to keep logging in day and night to avoid getting withdrawal symptoms ( been there done that). when there are home things going on, or guests coming over I take part in that. but let's say there's a t.v. show i don't like, or I already saw, we do separate things. By being open and honest - inworld and in RL. I always let any potential SL partner know that I am married in RL and that I'm not looking for anything outside of SL. I also don't keep anything from my husband as far as SL is concerned. He trusts me and doesn't care about me having partners inworld, because he knows I'm not looking for anything beyond that - plus he's even met a couple of them. If he asked me to stop playing (which he hasn't) would I stop? Probably not. I couldn't be with someone who was so insecure in either world. SL was very addictive years ago when I was a noob. Nowadays not so much. I rarely log in anymore. Easy, I wouldn't date someone that is married in RL. IMO if you are happy in you're RL relationship you shouldn't need to date in SL, unless of course you have an open RL relationship. To me it's a form of cheating, maybe I am just old fashioned. It's only cheating if emotions come into play, and if the two people involved aren't clear with each other about what they're looking for or expect out of the relationship. A lot of people in SL "RP date/marry" (myself included) for fun - It's like a grownup version of Ken and Barbie. Then of course you have those with ulterior motives who come to SL looking for "love" (more like lust), or to specifically cheat on their RL partners, so they tend to keep their online activities hidden. It's not for everyone, because some folks are not able to separate fantasy (RP) from reality, or they are being disingenuous from the start and people end up getting hurt in the process.